Marylou McDonald has been making Baltimore Album Quilts (BAQs) since 1991. She readily admits to having a real love affair for them. Baltimore Album Quilts were made in Baltimore between 1846 and 1852. She specializes in teaching appliqué using BAQ blocks as the medium for her teaching, lecturing on the history of BAQs and doing research on their history. Her research has led her to photograph and document over one hundred antique BAQs in museums and private collections. She provided most of the historical information for the 2007 Baltimore Album Quilt Engagement Calendar which Jan Whitlock of Jan Whitlock Textiles published. Several of the photographs of quilts in the calendar were taken by Marylou. She wrote the 2008 calendar based on her research. Marylou is a charter member of the Baltimore Appliqué Society and is a past President. She frequently writes a column for their newsletter based on her research. For other historical articles, click on Quilt History or use the link on the left or at the bottom of each page. In addition, look at her tips, tricks or techniques (the title used for her BAQ classes) also on this website. Click on Quilting Tips or use the link on the left or at the bottom of each page . In addition, Marylou is a member of of the Heartland Quilt Guild of the Eastern Shore, Helping Hands Quilt Guild, Faithful Circle Guild, American Quilt Study Group and three quilt dating groups. She was on the Board of Directors for The Quilters Hall of Fame in Marion, IN for three years. Marylou is featured in an article in the January 2010 issue of the American Quilter Magazine. 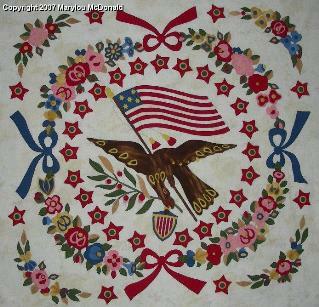 In this article written by Janet Z. Esch, Janet explains how Marylou and two of her Baltimore Appliqué Society friends have developed methods for creating authentic patterns from antique quilts. For further information about Marylou, click on About Marylou. To find out more information about her classes and lectures, click on Class/Lecture Info. You can find links to some of the websites that she frequents at Links. To see a slideshow of her quilts and her blocks, go to Pictures. And finally, to contact her or comment on her website, go to Contacts.